Network monitoring software can analyze performance in real-time, meaning that if a failure or issue is detected, the MJJT Staff will be immediately alerted. This rapid relay of information means that you can be informed of network problems wherever you may be, allowing you to instantly take corrective action and minimize potential downtime. 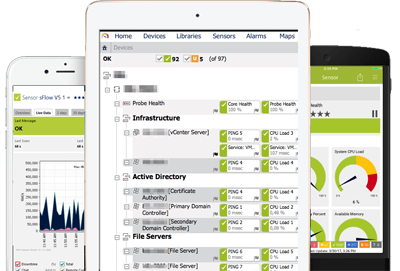 In addition, network monitoring software eliminates the need for a physical system administrator and manual checks. This can save your company both time and money, meaning that the problem is addressed effectively. When dealing with network monitoring MJJT staff makes it a responsibility to fix what is broken. Our monitoring service indicates multiple sensors, which offer a variety of monitoring options. The PING sensor, which checks the availability and uptime of your servers and other devices by running regular PING test. A number of sensors will allow you to measure metrics such as free space on disks, CPU and memory load, temperature, bandwidth usage. Some sensors which allow you to effectively monitor network usage and performance. MJJT will be alerted immediately when an issue has been brought up. In addition to all services, MJJT Consultants provides a 24/7 Live IT network monitoring services to ensure that any issues in your IT infrastructure will be noticed and be solved immediately before becoming an emergency. All of your selected devices will be monitored by out IT Monitoring System and Live Staff. So you can be assured that your business-critical systems are kept watched and taken care of.